While randomly walking about the city during our visit of Vienna, we accidentally stumbled upon this bookstore loaded with English books. The most interesting feature of the International Bookstore is the unusually wide offer of American magazines. However, the selection of books doesn't lag behind (the fiction section winning over the available non-fiction titles), and some of the titles were on offer at very reasonable prices, which is a pleasant surprise especially in the city of Vienna. We also appreciated the browsing-friendly environment of this bookstore. The history of the International Bookstore dates more than thirty years into the past, and as all great projects, it started off as a simple idea. In this case, two founders of this bookstore decided to bring something new to the German-speaking market - original American magazines. Magazines of all subjects - fashion, sports, lifestyle, tatoos, cars, bikes, music, movies and even erotics. The magazines went straight from New York to Vienna (not that straigh actually, a combination of boat and truck was used to transport them, remember, we're in the 70s...). Thus they opened their first store in Vienna under the name American Discount. The methods have changed through the years, but American Discount remains the primary source of American magazines in Austria. Most importantly, they have also decided to add American and Englis books to their stock and offer them to the customers of their store. The American Discount group has grown bigger through time, and nowadays it consists of two stores in Vienna, one store in Graz and four stores at what seems to be their favorite location - the international airport in Vienna. 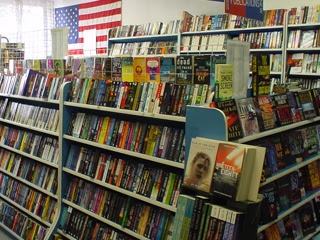 From 2007 on, all American Discount bookstores bear the simple name International Bookstore, an altenration which has been accompanied by an addition of some French, Spanish, German, and Russian titles to their offer. However, the vast majority of the titles is still in English. UPDATE: THE OLD Neubaugasse 39 A-1070 Wien store, which we visited, closed in 2011. Some other locations still remain. ALSO, Rechte Wienzeile 5 address store is closed, which leaves ONLY the stores at the airport open, which is a sad fact. There are 4 American Discount bookstores at the Vienna National Airport. For the location on these stores and the offices of the American Discount Group in Austria, please visit their official website. the one at Rechte Wienzeile 5 does not exist either, anymore. Such a shame. We updated the post but now it's just an airport bookstore. Thank you for the update though! Much appreciated.